… and many times it is misunderstood that the ceremony is the culmination of the whole process. People think that when I am accepted into the group as a member, when I am recognized by formal ceremony, then I am saved and whatever I do after that doesn’t matter, because I’ve been recognized. But that is not so in the process of bhakti-yoga. Srila Prabupada said, “The initiation is actually internal.” The disciple accepts the spiritual master in his heart and this ceremony is to confirm that. This ceremony marks the beginning of an eternal relationship. Actually Srila Prabhupada said, “the first initiation, this hari-nama-diksa it’s called, is when the disciple accepts the spiritual master. And the second initiation, the brahmana-diksa, is when the spiritual master accepts the disciple. With the second initiation the spiritual master begins to reveal more confidential knowledge to the disciple. But the disciple must first of all prove himself worthy. The test may be very difficult. In this initiation we give name to the disciple and he vows to chant sixteen rounds of Hare Krsna maha-mantra everyday, follow four regulative principles and to engage himself nicely in Krsna-seva, in service to Krsna. And the disciple can expect to be tested by material energy to see how determined he is in his wows. And if he passes this test, then the spiritual master will accept him. And in that second initiation, brahmana initiation, the spiritual master is agreeing to bring the disciple back home, back to Godhead. In the Mahabharata there is a very instructive story illustrating how a disciple may be tested. This concerns a son of the priest of the demigods, or guru of the demigods, his name is Brhaspati, and his son’s name was Kaca. So there was a war going on between the demigods and the demons. And the demons’ guru whose name is Sukracarya, he had a very wonderful ability, very wonderful spiritual power, he was a master of a mystical art called mrtyu-sanjivati which means he could bring someone who had been killed back to life in the selfsame body. So in the war between the demigods and the demons naturally many demons in their army were killed, many demoniac soldiers met with their deaths. But Sukracarya would bring them all back to life and they would again enter into the battle. Of course on the other side, in the army of the demigods, there were also soldiers being killed, but Brhaspati, he did not had this power. 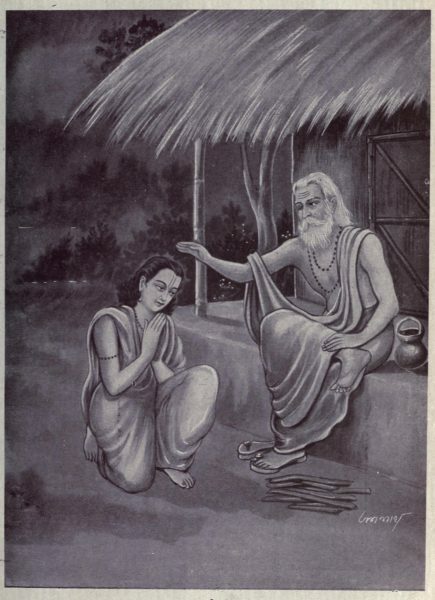 have to go to the Asuraloka and become the disciple of Sukracarya.” Now, you may wonder how that would be possible since apparently Brhaspati and Sukracarya were enemies – how could Sukracarya accept the son of his enemy as his own disciple? But in Vedic culture brahmanas were always above the politics – the politics was a concern of the ksatriyas, the brahmanas were above. Even though brahmanas might be on the side of the opposing kings, they would still be friendly among themselves. So it was not really a question of Kaca being an enemy of Sukracarya, that Sukracarya might not accept him. But it was a question of Kaca passing the test of his spiritual master. something is wrong. Kaca is not coming back from the forest today.” Sukracarya being a very powerful sage, he went into meditation and he realized what did happened to Kaca. So he applied the power of mrtyusanjivati. And he called forth Kaca from the bellies of these jackals. The jackal’s bellies burst open and all the pieces of Kaca came out and they came together instantly and formed his body again and he could come back to the asrama. When Kaca returned, DevayanI was completely in bliss and everything returned to normal, but the demons they again made a plot, they made a conspiracy again. So they waited in the forest and on another day when Kaca went to pick flowers they again attacked him and killed him. And just see qualification of this Kaca, that he had gone into the forest once and been killed, but the next day Sukracarya said, “Go into the forest, pick flowers for my daughter,” he didn’t say, “Oh, I am afraid, these demons will kill me again.” He just went out. This is service to the guru. So sure enough, he was killed again. This time they burned his body and they grounded the ashes into powder, then they mixed the powder with wine and they gave the wine to Sukracarya and he drunk it. So Devayani was again waiting for her beloved Kaca to return and it got late and she again was very worried. She again told her father, “Something is wrong.” And again by his power Sukracarya could understand what did happen. And now he realized that the body of Kaca was in his own belly. So he told Devayani, “Kaca is now inside of my belly. If I’ll call him forth, then I will die. And if I don’t call him forth, then he will be digested, and then it will not be possible to call him forth after that. Devayani began to cry and she was saying, “I can neither live without Kaca, or without my father.” In either case I will have to give up my life. So Sukracarya – because he was very attached to his daughter – he spoke to Kaca within his belly. He said, “Kaca, I am going now to teach you the science of mrtyu-sanjivati, and then I am going to call you forth and I will be killed when you come out of my belly, so then you bring me back to life.” So Kaca said, “Very nice,” and they did this. So at the end Devayani was very satisfied, she had both her father and Kaca. Then short time after that Kaca was released from the gurukula, because he had learned everything. Of course, the love story between Devayani and Kaca didn’t come to a happy end, but that’s another story. Kaca refused, she wanted to marry him, but Kaca said, “No, you are like my sister, because I am the disciple of your father. So we are like brother and sister.” But that’s another point, we were talking about Kaca’s total surrender to his spiritual master under the most difficult circumstances. How was Kaca able to pass those tests, because of his taking the service of his spiritual master to be more important than his own life. So quite frankly this is what is expected after this initiation. This is the meaning of a disciple accepting the spiritual master. And if the disciple shows this determination, then the spiritual master will accept him and reveal this knowledge of mrtyu-sanjivati. Actually, science of Krsna consciousness is the real science of mrtyu-sanjivati, because it’s not simply reviving life into the same material body, but it means bringing forth the spiritual body – the eternal, full of knowlege, full of bliss. So this again, I was speaking of the second initiation, brahmana initiation, the initiation when the disciple’s body becomes spiritualized, brahmana. This is what it means brahmana – brahma means spiritual – so brahmana is one who is spiritualized. When one is given brahmana initiation, then he may go on the altar and render personal service to the Deity. This requires his senses to be spiritualized.